Added 5 years, 9 months ago. For almost 20 years E&B Group Ltd has been involved with projects of all shapes and sizes throughout central London and particularly within the City. During that time our personnel and associated specialist contractors have all travelled to and from these projects via many varied routes on London streets. It was with this in mind that we were fortunate enough to recently attend an event specifically held to raise funds for London’s Air Ambulance. 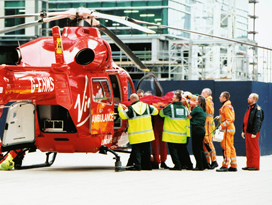 This organisation provides a 24/7 service to London utilising one helicopter and rapid response cars. They provide advanced care at the scene of an accident which can include specialist skills such as anaesthesia, blood transfusion and even open heart surgery. Last year alone they helped over 2000 patients in our capital. They are currently raising funds in order to provide a 2nd helicopter for this vital service. E&B Group Ltd believe that all of us working and travelling in London benefit from the skill and dedication provided by this type of organisation. For that reason we were pleased to be able to donate funds at the event. Visit http://www.londonsairambulance.co.uk/ if you are interested in this organisation.